This is another of the delectable treats Jess has found on Pinterest. This is our absolute most favorite muffin ever and we make it often. Microwave the cream cheese for about 45 seconds to make it much more stir-able. Add 1/4 cup of the sugar and stir until well combined. Set aside the filling portion until later. In a large bowl mix together the remaining sugar, flour, brown sugar, baking powder, baking soda, cinnamon, ginger and salt. In a separate bowl, mix together the eggs, water and oil. Pour the mixed liquid into the dry ingredients and stir only until mixed. I recommend not using an electric mixer for this recipe as it makes the muffins tougher. Or use muffin cups, but I have had good results with the spray. 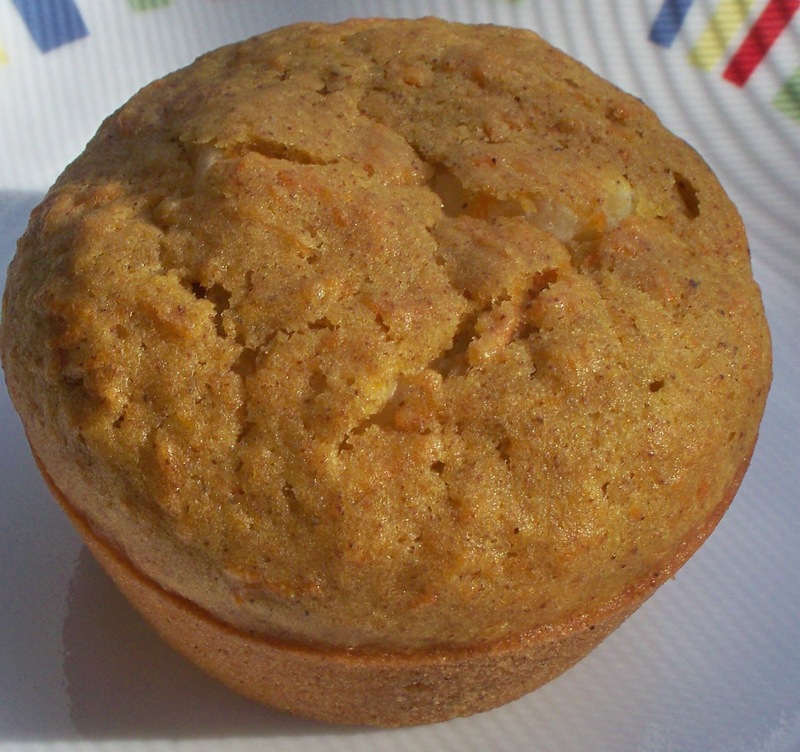 Put 1 heaping tablespoon of the carrot mixture into each muffin cup. Put a dollop of the cream cheese mixture into each muffin cup. Evenly distribute the remaining cream cheese if your dollops don't use all of it. Top each muffin with another heaping tablespoon of the carrot mixture. If any carrot mixture remains top off the muffins that look a little low. Bake for 20 minutes. 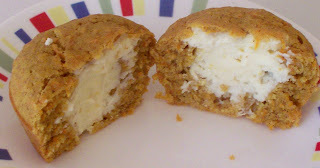 Some of the muffins may crack and show a bit of the cream cheese filling. This is ok.
Cook for 5 minutes in the muffin pan before removing to a wire rack to finish cooling.